Lotus Thai features authentic Thai cuisine made with the fresh ingredients and spices, surrounded by inviting atmosphere that defines the ideal setting for the special, happy hour or dinner with a friend. Our menu has been painstakingly created by regional recipes from Northern Thailand, Chiang Mai, and Bangkok. "Thai food ain&apos;t about simplicity. It&apos;s about the juggling of disparate elements to create a harmonious finish. Like a complex musical chord it&apos;s got to have a smooth surface but it doesn&apos;t matter what&apos;s happening underneath." Absolutely impressed by the immaculate service I received here from all of the workers I came in contact with! Hospitable, friendly, accommodating, and just simply striving to please. Not to mention the food was superb! Definitely will be returning! Keep up the great work guys! Best Thai food in San Diego. Lotus Thai has amazing food and great pricey. The best thing about this place is the quality of their food!. Love the ambiance! Servers were attentive and the food is soooo delicious! You have to try the beef jerky and green curry. Both my favorites. Best thai food place I have had in San Diego. I always know I can count on Lotus to come through for a great bite and a very cool vibe. Does get crowded but worth the wait for sure. Their service and cuisine is the perfect combination. 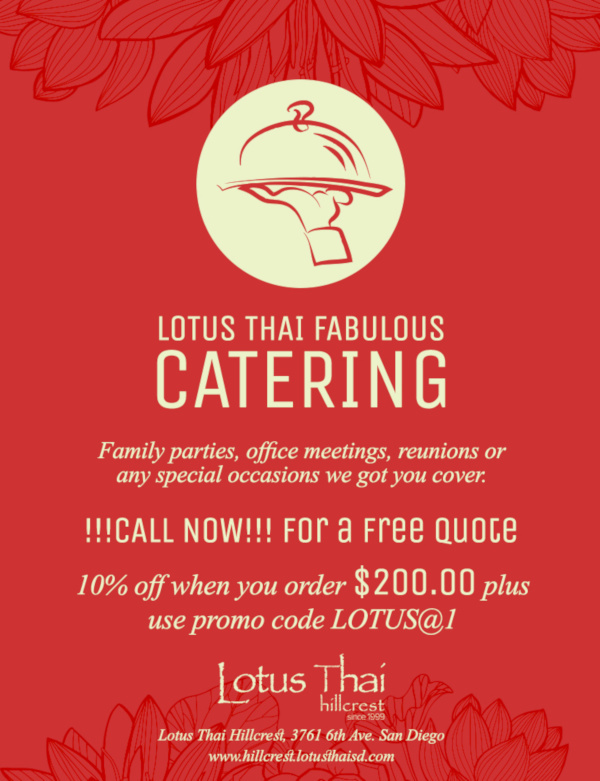 We have been frequenting Lotus Thai for years, and even though we no longer live in Hillcrest, we make an effort to drive back just for Thai!